Russian Foreign Minister Sergei Lavrov (L) and United Nations special envoy on Syria Staffan de Mistura enter a hall during a meeting in Moscow, Russia, May 3, 2016. A team led by the United States, Russia and the United Nations is working to finalize a plan that could restore the cessation of hostilities in Syria, where fighting between the government and rebels could unhinge a multinational effort to fight the Islamic State. “Our teams, on a military-to-military basis, are working through the details that need to be implemented so that this can be restored,” said Secretary of State John Kerry. He commented Tuesday, a day after holding emergency talks in Geneva with U.N. Special Envoy for Syria Staffan de Mistura and other officials. Kerry also spoke by phone to Russian Foreign Minister Sergei Lavrov. The U.S. and Russia are co-chairs of a Syrian cease-fire task force. 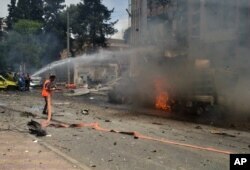 In this photo released by the Syrian official news agency SANA, Syrian citizens and firefighters gather at the scene where one of rockets hit the Dubeet hospital in the central neighborhood of Muhafaza in Aleppo, May 3, 2016. Earlier Tuesday, Lavrov told reporters he was hopeful that a truce could be agreed to “in the nearest future, even in the coming hours.” He commented as he met with de Mistura in Moscow. The flurry of meetings came after a cease-fire, announced by world powers in February, began unraveling, especially in Aleppo, Syria’s largest city. 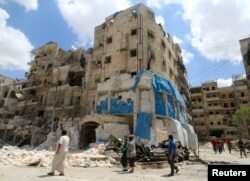 Since late April, more than 270 people have died as a result of fighting in the city, including more than 50 who were killed in a Thursday airstrike on a hospital blamed on the regime. 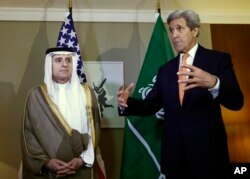 U.S. Secretary of State John Kerry, right, gestures next to Saudi Foreign Minister Adel al-Jubeir, left, during a meeting on Syria in Geneva, Switzerland, May 2, 2016. “We are particularly aiming to try to restore this [cease-fire] in Aleppo,” Kerry said. He did not spell out details of the plan being discussed by negotiators in Geneva but did indicate there could be consequences for Syrian President Bashar al-Assad if he did not comply. Lavrov said he urged U.S. officials to put pressure on moderate rebels to leave territories occupied by Islamic State fighters and al-Nusra Front jihadists. Syrian civil defense volunteers and rescuers remove a baby from under the rubble of a destroyed building following a reported air strike on the rebel-held neighbourhood of al-Kalasa in the northern city of Aleppo, April 28, 2016. The battle for Aleppo is key at a time when the conflict has become a test of U.S. commitment in the region. He spoke after a series of rockets, believed to have been launched by rebels, hit a hospital and other buildings the city, killing at last 16 people. People inspect the damage at al-Quds hospital after it was hit by airstrikes, in a rebel-held area of Syria's Aleppo, April 28, 2016. Jasmine Gani, an analyst at the Center for Syrian Studies at the University of St. Andrews in Scotland, told VOA that perceptions of U.S. legitimacy in the region hang in the balance as a result of what she called a "mismatched rhetoric and policy." She said Washington raised expectations by calling for Assad's exit early in the conflict and then failed to provide the support needed to carry out that aim. With Russia now figuring strongly in the equation, Gani said, the U.S. "has to be a lot more careful as to what it puts its commitment to. In the past, it was not such a problem, but the shift of dynamics in global power means there is greater scrutiny on the United States to fulfill its promises." VOA's Luis Ramirez and Ken Bredemeier contributed to this report.